This is a zebra duiker looking for some fruit to eat. Today I want to write about a fascinating species of animal, the zebra duiker. These cute little antelopes grow up to 90 cm long. Both the males and females grow horns, but the males’ horns are twice as long. The word duiker comes from an Afrikaans word meaning diver, which describes how they run into the deep forest when they are alarmed. They mainly eat fruit, seeds and leaves. As they aren’t very tall, they rely on the fruit that is dropped to the forest floor by tree-dwelling animals. They live by themselves or in breeding pairs and their stripes help to camouflage them in the forest so that they can hide from predators such as leopards, African gold cats, African rock pythons and crowned eagles. Zebra duikers are found in the thick forests of Liberia, Sierre Leone and Ivory Coast and are considered vulnerable due to loss of habitat. Are there any other interesting facts that you would like to share about zebra duikers? I did a slide show about Zebra Duikers when I was in fith grade. I really like the picture of the Zebra Duikers. I can give some more fact about the zebra duikers. the Zebra Duikers can weight between 20 and 44 pounds. 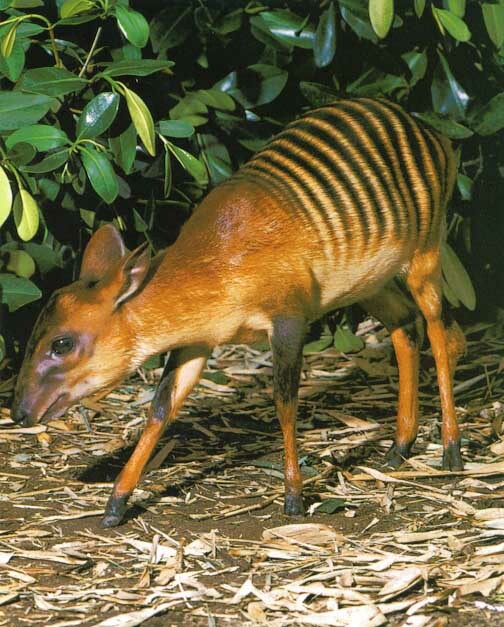 Zebra duiker is named due to specific coloration of the body. They have 12 to 15 black stripes that stretch from behind the shoulders to the tail. Both males and females have horns. Baby zebra duikers depends on the mother’s milk during the first three months of its life. But i really like the new animal . And Can you do a more new animal the next time ?